Commentary on the Facets of Life, Usually Based on Personal Experience, Data, and Logic. Home Works of America, Inc. I was a senior at Vanderbilt on November 22, 1963, the day of President Kennedy’s assassination. JFK had visited Nashville and spoken at Vanderbilt’s Dudley field May 18, 1963, and in spite of my anti-Catholic Southern Baptist and Republican upbringing, I was impressed. The 1960 election had been a hot topic of discussion in my High School Senior American History Class in the 1959-60 school year, Mrs. Beach expressing amazement that JFK’s Catholicism should be an issue. Reflecting on those events brings thoughts of how our culture has changed over the intervening years, from a time before 24 hour news, when the media protected or ignored the private lives of politicians to some extent (Maybe they still do and we are in worse trouble than we think. ), and when most adults still remembered the horrors of and the unity resulting from WWII and knew we were still paying off the debt from it. The marginal income tax rate was 91% on individual income over $200K, a very rare level of income at the time. We were a nation accustomed to sacrifice for the common good. We had a strong economy with lots of jobs, but there wasn’t a lot of money floating around and little or no conspicuous wealth. GDP per capita was about $3400, approximately $27,000 in 2013 dollars. So we are now twice as rich with nominal GDP per capita at around $56,000. It was a time without Medicare, Food Stamps, or wildly inflated education and medical care costs. Tuition at the University of Tennessee was $225 per academic year and at Vanderbilt, less than $1000. There was no “War on Poverty.” And, because the ratio of workers to retirees was large and life expectancy much lower, Social Security was not yet a financial burden on our economy. Hamburger, fries, and a Coke came to about fifty cents. Most sit-down restaurants were of the “blue plate” variety, and few customers were sipping expensive wine with their meatloaf, mashed potatoes, and green beans or lining up on the way to work the next morning for cups of ridiculously expensive calorie laden coffee with funny names. Spending flexibility was limited with no credit cards packing our wallets. Well, maybe Diners’ Club was around. Broken families were the exception rather than the rule, and there were strong schools, with good discipline and respect for teachers, for both races, in the lamentably segregated South. I believe the possibility of a “Camelot image” had more to do with the times than with the Kennedy’s. The Eisenhower (I like Ike.) years were pretty good too, though the media did chastise him from time to time for playing too much golf. It is interesting to wonder how much longer it would have taken for the US to become a debt-laden social welfare state had Kennedy lived and denied LBJ the opportunity for fundamental “guns and butter” transformation based on the emotion around the assassination. And we can wonder if JFK would have figured out a way to “win” the war in Vietnam as he promised. In any case, the combination of the assassination, with others to follow, and the Vietnam War debacle marked the second biggest turning point, affecting culture, economics, and politics, after the Civil War, in American history. 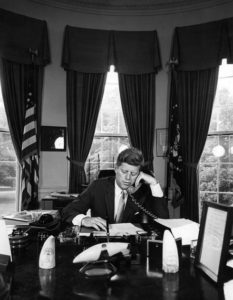 Those changes and the impact of them have been accelerated by incredible advances in information technology that now allow me to Google “President Kennedy visits Vanderbilt” and immediately come up with reports on the visit and the text of the speech he delivered. It is tempting to grab a sound bite, a tweet perhaps, from the speech. One striking thing that would miss is that he promised nothing to anybody. OK, I am going to give in and choose a quote that establishes the general theme of the address. It includes one of the two or three times he used the first person singular, and it tells a lot about the different tenor of the times. You can read the speech, including some editing and margin notes, in about ten minutes here. Strong Economy? Give Me A Break! Happy New Year. It’s Infrastructure Time! Irrational Government Meddling: Stop It! You Didn’t Create That Job!